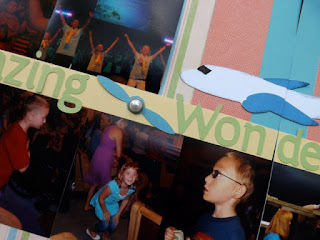 My kids went to Vacation Bible School at my Mom's church last year and had a wonderfilled time! These pictures are from the last night of Amazing Wonders Aviation VBS! I really wanted to do propellers and couldn't find any on my Cricut cartridges so I cut a daisy type flower from my Art Philosophy Cartridge and trimmed out all but 2 petals that were opposite each other and added a pearl badge button from the Wrangler Assortment ! I love the way they turned out and had so much fun doing it! 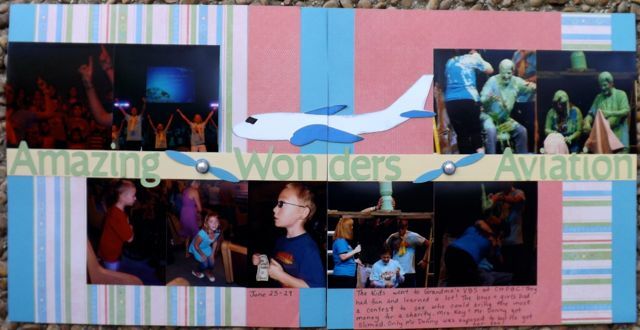 Love finding creative solutions to dress up your page when you don't have what you want/need! The paper I used was the retired Caboodle, still available on Studio J! I also cut the title using the Artiste Cartridge! Sharing with you inspires me to push further and get creative! Fun page. Love your creative solution, too!